bad results in write speed in RAM, what could be the problem? What is bad? You really aren't explaining what the problem is. Looking at the results I don't really see anything that incredibly off. Providing a good description of exactly what is wrong only helps. can you check whether both BIOS and OS still read your RAM capacity as 16G? btw, just saw your BIOS is way too old, the current one is 1.A, i'll recommend you to flash to the latest BIOS. It is not a matter of bios, if it were a matter of bios, then others would have the same thing. I read a review. A person had bios 1.20 as I did - and he did not have such a problem. Here is a review. Bios like me (1.20) no problem. It's not about bios. 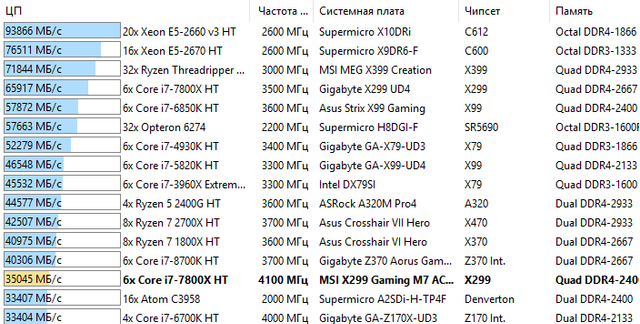 - Updating the BIOS is also not always a successful option) there may be other problems as a rule. Your 'example' isn't an MSI board, or atleast it isn't displayed as such. Who knows what board it is. If it was the same board, it would show that. Your 'example' also has a much different (higher end) CPU than yours. Your 'example' also is running a much different (higher) bus speed, and therefore higher bandwidth. So...saying the BIOS doesn't make a difference because your 'same example as your system' isn't the same, not at all. Our suggestion is to update the BIOS. If you don't want to do that, then I'm not sure we can say anything else but to get different RAM. Or change your RAM settings. But even then, there's nothing that says it's going to get the same number or close to it. Is your ram a 4x16GB kit? Or was it 2 x 2x16GB kits? Found a user with the same CPU, same motherboard, updated BIOS, no issue. I do not think the problem is in bios. Perhaps the problem is that I do not manually overclock the processor. I use motherboard auto overclocking "Game Boost"
I wrote in the first message that I use 4 modules of 4 GB each. Does it matter? 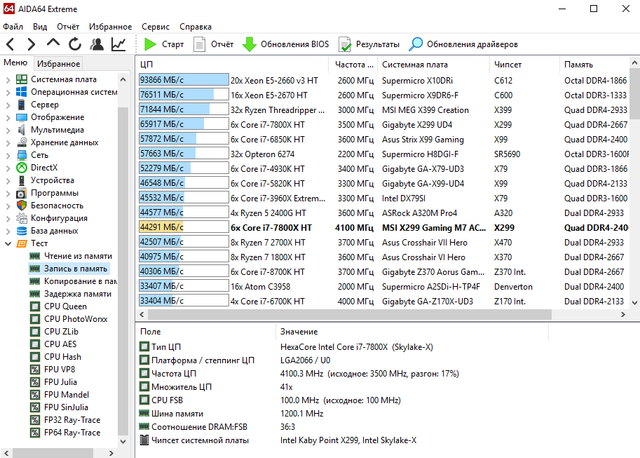 Maybe this is a problem due to the automatic overclocking of the processor? if you refuse to update BIOS, what is the point of even being here, lol. 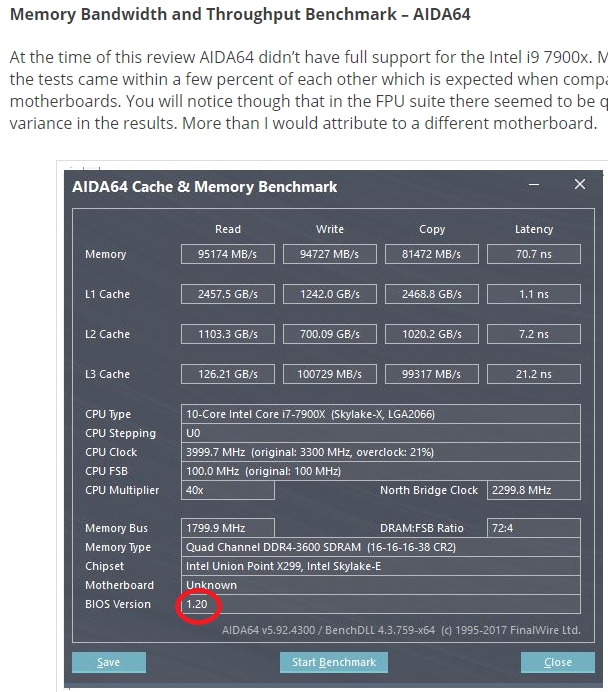 any test should be continued after you flash the BIOS because apparently from the picture darkhawk posted, the CPU has been overclock to 4.1G (possibly with game boost level 1, too) and the memory performance is looking fine. And here different sets of memory? I wrote. I bought. Kit. Includes 4x4 SAME memory. What are you talking about? I did not buy a different memory. This is a kit. Updating the BIOS does not always benefit - it is a known fact. Even the support says "if the system works stably there is no need to update the BIOS"
Multiple people have suggested updating the BIOS but you refuse to do that. Ok. Multiple posts here online also indicate that buying 4 sticks of the same memory is not the same as buying a 4x4GB kit of memory. That's known fairly well in any gaming community, especially if you want good performance. There's a reason that it's a 'kit', because they are matched together and provide similar performance. Single sticks aren't. Just because XYZ system works fine this way, doesn't correlate to anything on ABC system. Again, apples and oranges. Even more so with your examples. Please stick to the system being discussed. I highly doubt overclocking the CPU (either manually or with the automatic 'gameboost' function) will have any large impact on this particular test. But I could definitely see a BIOS update changing the situation. Perhaps the settings for a particular processor (like yours) are incorrect for the memory? That would explain why someone with a different CPU but same board same bios doesn't have the problem and you do. If you don't want to take the advice we provide, then I suggest you contact MSI directly. They can then help you directly (and will most likely suggest updating the BIOS as the first step, just like we are).